I should have added that the terrain really does slow any French development on forces. The Austrians can move reserves fairly freely by comparison. I would think this is a good scenario for a newbie to take the Austrian against a more experienced French player, but otherwise the imbalance is too great if the Austrian can use his advantages.. PLayed this last week. Lost 3-8 as the French. I did manage to gain a temporary victory point at one stage, but that was short-lived. Towards the end I should have nabbed another couple of concolation banners but the dice deserted me. The Austrians do seem to be everywhere, but for me the killer arer the three cavalry units. 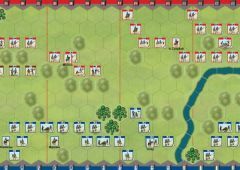 My opponent brought them forward and then launched them into a cavalry charge which pinned three of my infantry units in square. 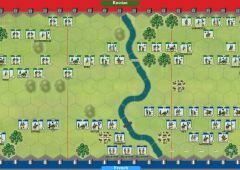 Having seen the danger I did position the infantry so he'd get no dice in combat after I formed squares. But I was then down to two cards and the only cards in the centre and right were whisked away by the dquares. For the next few turns I only had two cards with orders for the left wing. 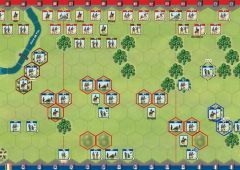 I realised that his cavalry could waltz away, attack other infantry units, and they wouldn't be able to form square because my other squares couldn't form back for lack of cards. This is highly ahistorical! 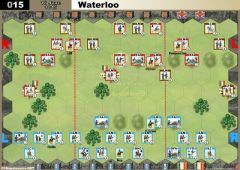 The regimental/battalion commanders would know to form back when the cavalry danger was passed. 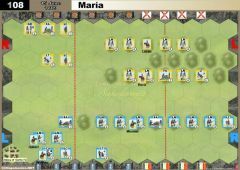 I've always felt this an imbalance in favour of marauding cavalry, but in this scenario it made me realise a well timed cavalry "feint" can paralyse the opposition and then the same cavalry units can begin to pick off other infantry units when they can't form square. Has anyone else found this in any of their C&CN experiences? Fortunately for me, my opponent didn't realise the opportunity he had and eventually I was able to get back my cards (two only after those units were destroyed). Otherwise he played very well and deserved his victory, but man was it frustrating from my side? First of all, one piece of errata. 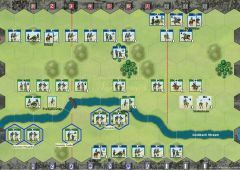 On the VASSAL edition, there is a French leader missing that should be attached to one of the two light cavalry units. Thx, i will replace the scenario pic asap and the vassal setup with the next major update. 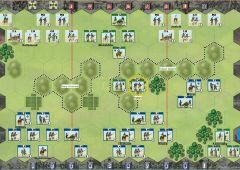 As for the battle itself, I'm pleased to say that I won this game as the French yesterday in an 8-7 banner score and as the score suggests, it was an extremely tight affair and a stimulating game. Will have to see how I get on playing it as the Austrians next time round. Scenario stats support this view. Played this twice today against Master Chief. Both games went to the Austrians (8-5, 8-4). 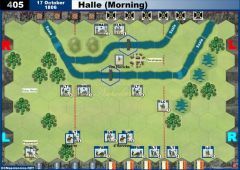 Austrians never lost their hold on the towns in both games. 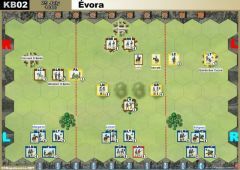 Each game played quite differently, the first becoming a drawn out affair that used at least 2/3rds of the deck before an Austrian play of the Elan card got the 8th banner. 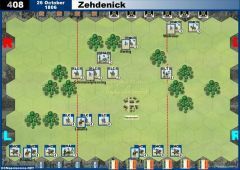 French had some luck with getting a banner or 2 with lucky rolls to wipe out Austrian units easily, while the Austrian kept rolling just 1 short of totally eliminating French units. 2nd game went much more quickly as aggressive French moves in the centre and right put them into the Austrian firing line early and they got hammered. 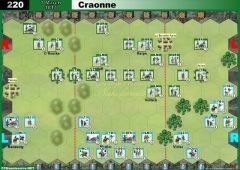 Prudent use of the central Light cav by the Austrian also helped as it forced reduced French infantry into square then hit French artillery without support (heavily reduced or in square). Finally getting the message that being aggressive in this game comes at a price - dead units!